Half of the team members are enjoying their much deserved vacations, and our programmer and game designer is back and working on the blocking of the final zones of the game! Most of the ideas are in paper and sketches including the puzzles, encounters, cutscenes and events. 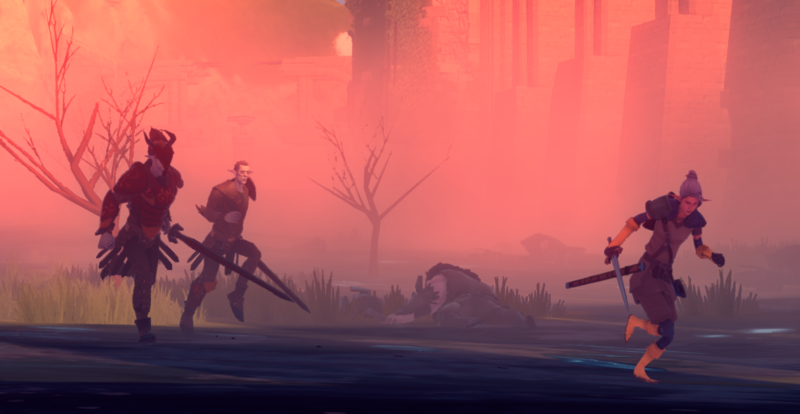 Blocking the final zone of the game provides an opportunity to look at the game as whole, while also considering its pacing and mood building and performing small tweaks here and there. Right now we are blocking the Bottom of the Rift Windmills, the area inhabited by the previously revealed canyon kids. We’re aiming at a spicing up the place with a lot of exploration opportunities while taking advantage of the topology of the terrain to include plenty of vertical exploration as well. Here’s a small preview below. Bottom Rift Windmills blocking preview. Like we mentioned above, small tweaks and polish passes were made in the previous zones in order to achieve the intended mood. Below you will find two pictures, the first one being of the Old Woman’s House, and the second one an encounter with two cursed soldiers that are into jogging. Old Woman’s House in the woods. Hope you’ve enjoyed our devblog update, have a great weekend! This entry was posted in Dev Blog, Level Design, WIP and tagged 3D, Ilumination, WIP on September 1, 2017 by Andre Constantino.